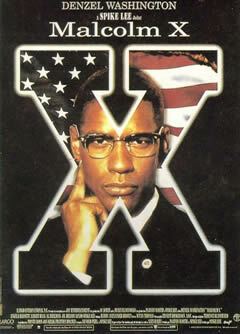 A fantastic movie, and while I'm not a huge Spike Lee fan, I do think he was robbed by not at least getting an Oscar nomination for Malcolm X.
I had read The Autobiography of Malcolm X in college and was very impressed with how faithful the movie was to the book. Robert: Thanks for the comment! I agree: Lee was robbed that year, as was Denzel Washington. Lee deserved the nom, Washington the win. Al Freeman Jr. was also robbed; he should have been nominated. One could make a case for him being nominated for DUTCHMAN (1966) as well. Hal: Thanks for the comment! There were a number of actors from this film robbed when nominations were announced that year, and yes, Al Freeman Jr. was definitely one of them. Unfortunately, I have yet to see DUTCHMAN, but will try to track it down.